If you’re into manga and anime, you’ve most certainly heard about Naruto—the spikey-haired, orange-suited ninja with dreams as big as the Village Hidden in the Leaves. 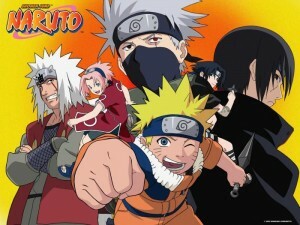 As the third best-selling manga franchise of all time, Naruto has made itself readily available through multiple outlets—books, anime, movies, figurines, and more. 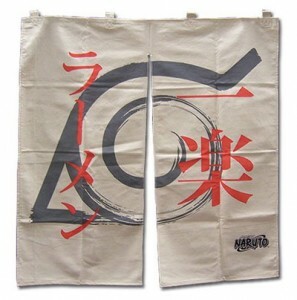 For the self-proclaimed fan, a plethora of unique Naruto merchandise is just a mouse-click away. With literally hundreds of different options available, however, the task of tracking down that perfect collector’s piece can seem daunting. To help you out, we’ve compiled a list of some of the rarest, and most unique, Naruto merchandise in existence so that you can expand your collection with original items exclusive to Japan. Those seeking the ultimate in stealthy comfort will want to check out these officially licensed shoes. 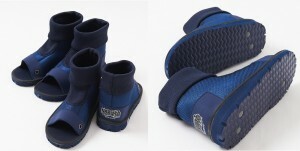 Crafted from flexible polyester and dyed the traditional navy blue of the Hidden Leaf Village ninja, this unique collector’s item is guaranteed to make your feet swift and silent as a ninja’s. Unfortunately, the shoes are only sold in Child S and M sizes, making them wearable only by children or those with petite feet. Whether you wear them for show or collect them for pleasure, however, these ninja shoes are distinctive additions to your assortment of Naruto gear. Looking for the perfect way to stay dry during the rainy, summer months and express your love for Naruto at the same time? Then this Akatsuki print umbrella is the perfect one for you! Sporting the iconic red clouds against a stark, black background, this three-fold umbrella is none-the-less white on the inside and comes with an attractive sheath, emblazoned with the Naruto logo, for storage. At forty inches in diameter and crafted from water-proof nylon, this umbrella is guaranteed to keep you dry during wet days in the Hidden Rain Village. Ideal for coin collectors, these 2-inch medals are limited editions released during the theatrical runs of the various Naruto films. Each medal is dual-sided, featuring two different images, with the most recent medal featuring adult Naruto and Hinata from The Last: Naruto the Movie. Transform your kitchen into your favorite ramen shop with these decorative curtain replicas and give your home an Ichiraku flair! It’s the perfect way to express your love for Naruto and brighten up your dreary windows at the same time. Don’t forget to eat some delicious ramen noodles while hanging these thick, thirty-two inch curtains. Perfect for sand ninjas and Naruto fans alike, this nearly life-sized gourd bag contains plenty of storage room for all of your traveling needs. Whether you’re toting your school books or gym equipment, using it as a carry-on airport bag, or doubling it as a cosplay/Con-souvenir storage piece, this multi-functional shoulder bag is guaranteed to set you apart from the crowd. At twenty-three inches tall and twelve inches wide, this gourd comes with an adjustable shoulder strap for easy carrying, as well as multiple openings (drawstring, Velcro, and zippers) for the ultimate ease of access. 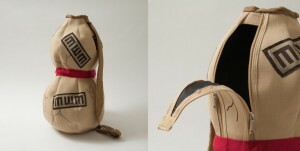 From school books to chakra-powered sand, this Gaara-themed tote bag stores it all. These special edition playing cards commemorate the 30th anniversary of Pierrot—the Japanese studio responsible for bringing Naruto to the anime medium. Featuring some of Shippuden’s most beloved characters and iconic scenes, these playing cards are the perfect way to relive some classic Naruto nostalgia while simultaneously challenging your friends and family to Poker, War, Go Fish, or any of your other favorite card games. With this Naruto-themed tissue box you’ll never be unprepared for another emotional moment in the series. Decorated with cute, chibi-fied versions of the Shippuden characters, this colorful tissue box will sate your eyes and nose while still making you smile. Sleep like a ninja with this one-size-fits all, Kakashi-themed eye mask. Whether you’re sleeping on a long plane commute, or snoozing it up in your bed at midnight, this mask offers total comfort and satisfactorily blocks out the light. Onlookers glancing at Kakashi’s dangerous sharingan and scarred face will think twice about disturbing your sleep.